The COORD3 BENCHMARK™ CMM offers customers a high-performance cost-competitive CMM with the added benefit of a small footprint. The unique 'half-gantry' advanced alloy design places its X and Y axis at the same level, providing increased rigidity and thermal stability. The unit offers an outstanding metrology platform for high accuracy small and medium part CMM inspection. The ergonomic open structure of BENCHMARK is ideal for the inspection of high-volume production parts or of single part inspection at the smaller manufacturing operations. Its compact size is ideal for production CMM or quality room applications and fits through a standard width door. The full air-bearing BENCHMARK CMM, with accuracy of 2.5 microns and a measuring volume of 600mm x 500mm x 440mm, comes equipped with both a Perceptron Laser Scanner and a Renishaw touch-probe. Following the recent acquisition of COORD3 by Perceptron, the company's Laser Line Scanning Sensor has been seamlessly integrated into TouchDMIS™ software, allowing reverse engineering and dimensional inspection to be performed by the multi-sensor CMM. 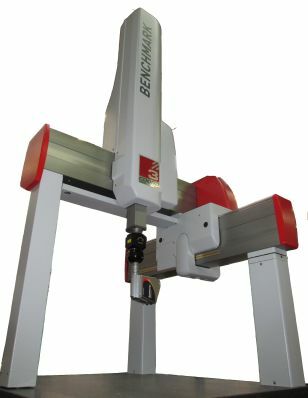 BENCHMARK is available in manual or CNC configurations. Manual units can be upgraded to full CNC in the field at a later date, offering a two-phase investment in CMM technology. The Hybrid BENCHMARK is the ideal job shop CMM. Perceptron's TouchDMIS, the 'game-changing' software for CMM usability, offers the world's first all TOUCH CMM software with full CAD capability with newly-added point cloud handling capability. TouchDMIS requires just a few hours of training and takes the 'expert' out of CMM measuring and programming. Perceptron's CEO Jeff Armstrong states, "The introduction of this new product is a direct result of our recent acquisitions and is the first step in our plan to offer a full range of coordinate measuring machines with intuitive, easy-to-use software and best-in-industry scanning technology."